Chor der Bayerischen Staatsoper, Bayerisches Staatsorchester / Kirill Petrenko. Stage director – Lotte de Beer. Bayerische Staatsoper, Munich, Germany. Sunday, December 17th, 2017. Although performed over the years in isolation, the three operas that make up Il trittico had to wait until 1959 for their Munich premiere. 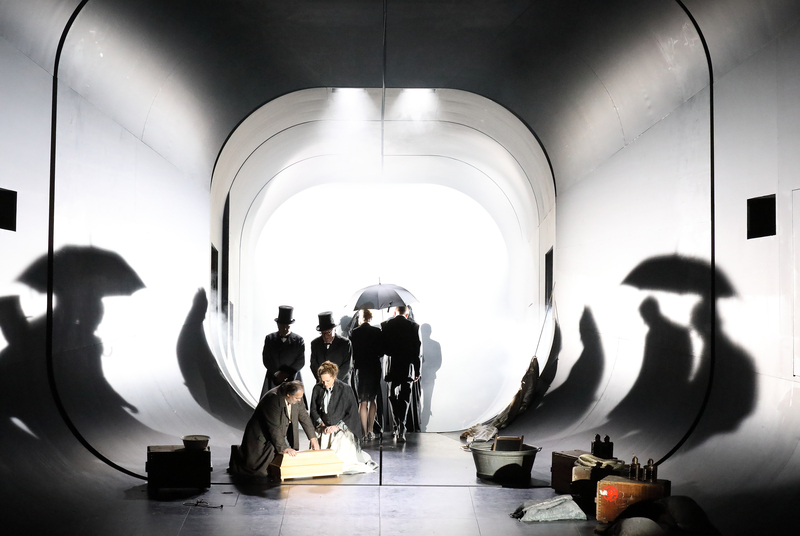 For this, the last new production of 2017, the house entrusted the work to Lotte de Beer, winner of the 2015 International Opera Award for Best Newcomer. Trittico is an ideal work for a house such as this with a strong ensemble and led by the music director, Kirill Petrenko, this is above all a showcase for the house forces. Indeed, this was the first premiere that I have attended in a very long time where the applause for the production team was absolutely unanimous – not a single boo to be heard, the production team receiving an enormous ovation from the public. De Beer’s staging is relatively conventional in terms of costumes (Jorine van Beek), placing each work in the period in which it was set. In an interesting note in the extensive program book, de Beer mentions how she sees the work as if looking through a camera, with each instalment going back through time, the focus of the zoom ever expanding. This was translated into the set (Bernhard Hammer), an aluminum tube that indeed looks like the inside of a camera. What we become aware of, as the evening progresses, is that what we see is very much a snapshot of reality. There are events taking place beyond what we can see, that feed into the action and have implications for it, yet all that we ever see is a snapshot of what lies beyond. 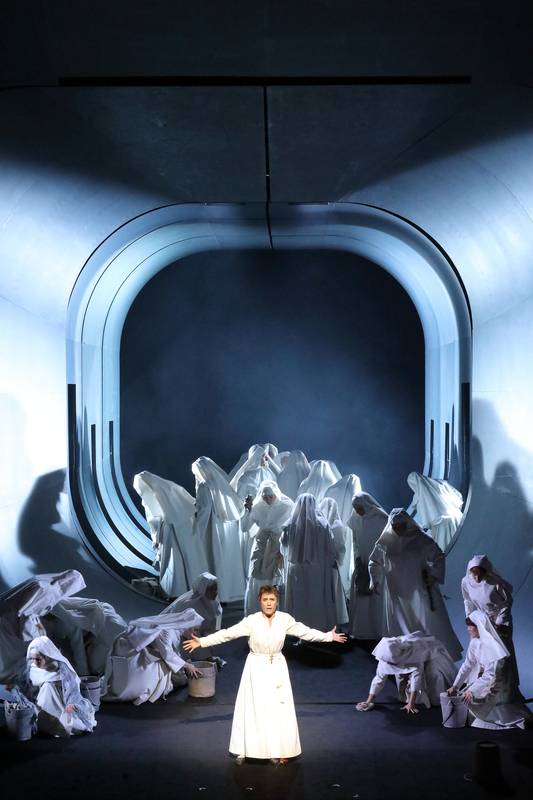 De Beer also gives us an impressive coup de théâtre with the set rotating to reveal the dead Luigi’s body or Angelica’s son imprisoned within a cross. 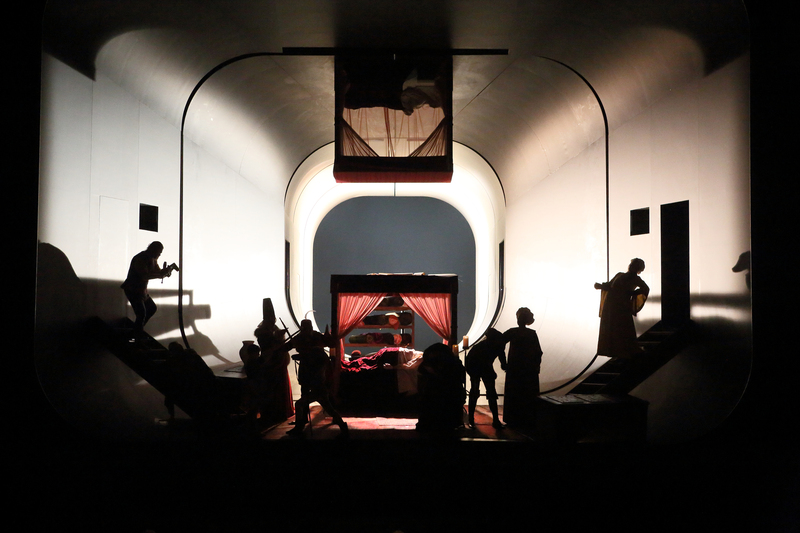 The downside of this approach is that the stage area available through this aluminum tube is limited, meaning that in Suor Angelica, there was a tendency for the nuns to be simply parked on stage in groups, rather than creating distinct personalities as we saw with the family members in Gianni Schicchi for example. This was also hampered, inevitably, by the fact that that the nuns’ habits also made it difficult to discern individuals. Nevertheless, de Beer gives us an intelligent and moving piece of theatre. 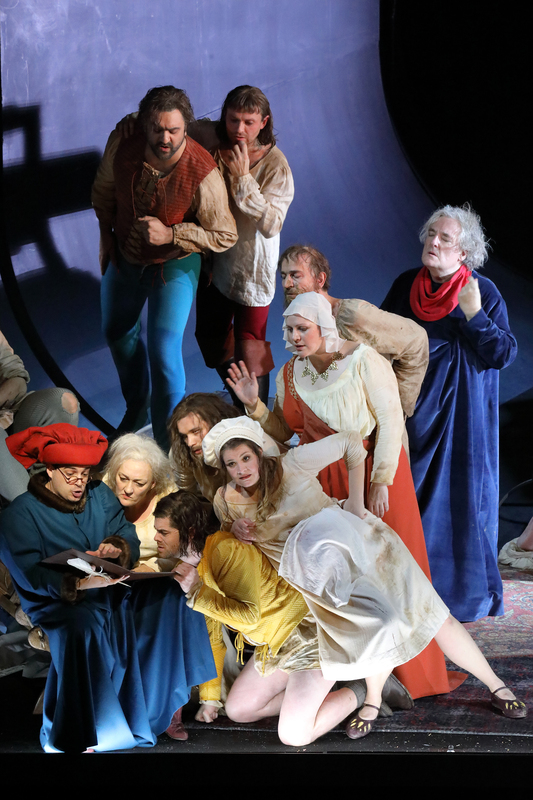 At its best, it gives us a vivid narrative, featuring believable, flesh and blood characters – Giorgetta and Luigi can’t keep their hands off one another (even when there are others around) and the family members in Gianni Schicchi are delightfully vivid. The way that Suor Angelica stood up to the Zia Principessa was a lot more physical and, in turn, more painful than it often seems. This is a show that is technically assured, fluently delivered and has been exceptionally well rehearsed. In the massive ensemble cast the overall musical and dramatic level of the performances was stupendous. It seems almost injudicious to single out individual performances given the exceptionally high level of the whole. Eva-Maria Westbroek sang with freedom and honesty as Giorgetta. The tone is somewhat shallow and short on top but the personality that she brought to the role was absolutely genuine, shading the dynamics with delicacy, the registers absolutely integrated. Wolfgang Koch was a rock solid Michele, the emissions always even, the tessitura causing no issues. If there was a tendency in places for him to resort to crooning, this was a passing effect. Lee Yonghoon was a robust and rustic Luigi. The text seemed somewhat indistinct and he seemed to offer us only two dynamics – loud and louder – but he was certainly good value. Claudia Mahnke was an agreeably fruity Frugola, with a warm chest register, making much of her short interjections. In Gianni Schicchi, Ambrogio Maestri completely dominated the stage in the title role. His diction was absolutely impeccable, bringing out so much of the character through the text. He was a massive stage presence and the voice seemed huge – undoubtedly amplified by the aluminum tube. He was a witty and humane presence, bringing out the warmth that he felt for his daughter and his satisfaction in making her happy. As his daughter, Rosa Feola, brought a beautiful legato to her hit number, the strawberries and cream tone absolutely beguiling. Pavol Breslik was a delightful Rinuccio, singing with ardent, youthful tone. 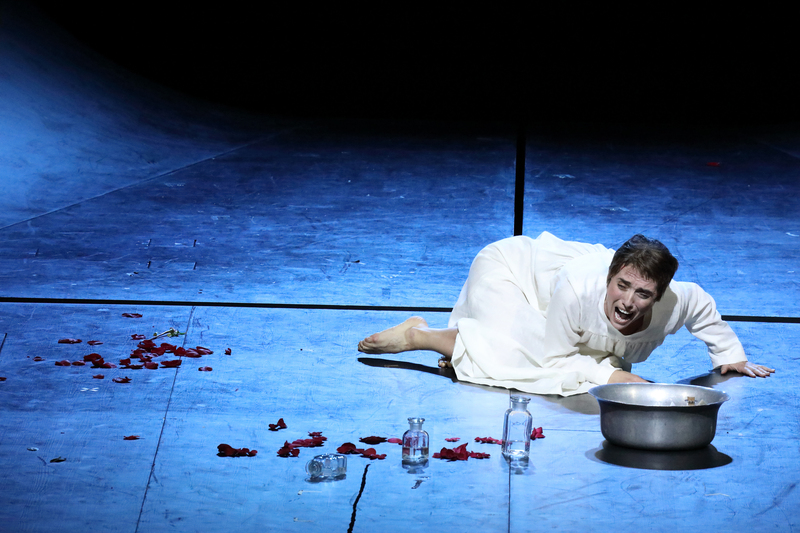 Selena Zanetti was a nicely lyrical Nella and Michaela Schuster gave us a fabulously strident Zita. 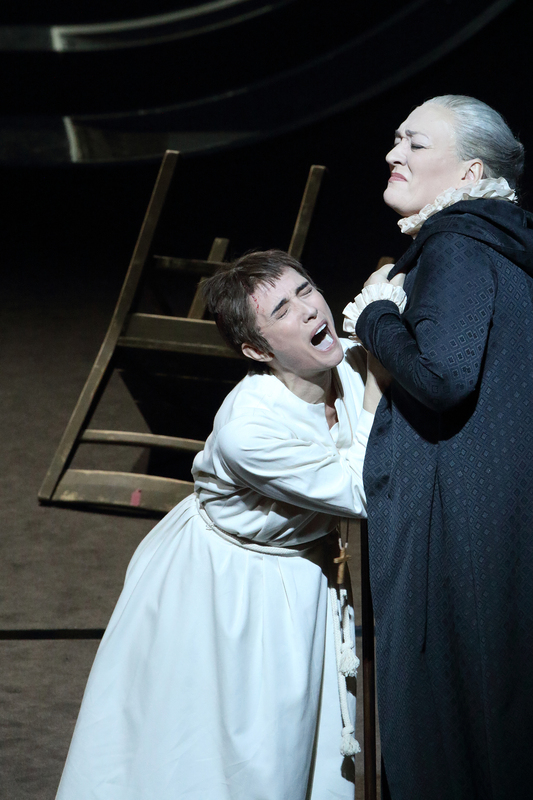 In Suor Angelica, Schuster struck sparks as the Zia Principessa off of Ermonela Jaho’s Angelica in their big confrontation. That scene was absolutely electric, the pain and desperation vividly brought to life. The registers may have parted company in Schuster’s voice but the instrument is massive with a warm and chocolatey lower register. Jaho simply owns the role of Angelica. Hers was the standout performance in an exceptionally good cast. What distinguishes her performance is her unflinching vocalism – never afraid to sacrifice the beauty of the tone, she gives so much of herself to us. She started her ‘senza mamma’ daringly quietly, the tone a single thread of sound before the voice bloomed to a silvery warmth on top. She brought out so much detail in the text, colouring the words to make the impact even more direct and made her Angelica absolutely devastating. Jaho is surely one of the greatest singing actors of our time. As I mentioned above, the standard of the remainder of the cast was exceptionally high as indeed was the playing of the ladies and gentlemen of the Bayerisches Staatsorchester. Kirill Petrenko brought out the glorious sound world of this exceptional band, from delicate gossamer strings to full and resonant brass. They played the room as much as they played their instruments, bringing out an infinite range of colours. 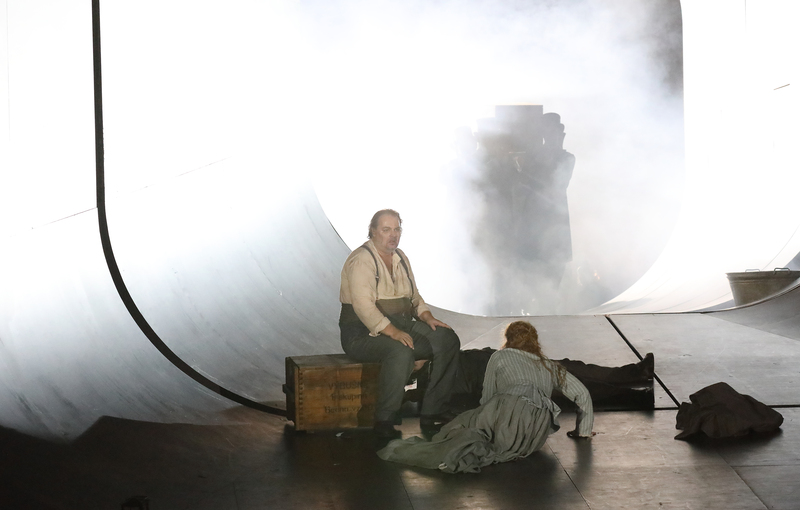 Petrenko took Tabarro at a flowing, lilting tempo, while Suor Angelica was given space to evolve. Perhaps, Schicchi felt a little too driven, but it certainly meant that the action hurtled to its inevitable conclusion. This was an exceptional evening in the theatre. We were given a highly intelligent production, extremely well sung throughout the entire cast, and played with distinction by the house orchestra. It achieved in doing what a great Trittico does – it gave us the entire gamut of emotions so that we laughed, cried and felt everything in between. As Schicchi delivered his final lines, Maestri speaking with such warmth and humanity, it really felt that we had experienced all that life has to offer. Il Trittico/BSO. Merci de cette critique bien circonstanciée qui reflète le ressenti de la diffusion audio. Merci à vous pour ce généreux commentaire. What I like so much about Operatraveller’s reviews is that he is always so gracious, never chipping away for one-upmanship-seen-it-all-before’s-sake. I feel that he understands he has had the privilege of being at each and every far-flung performance and with this approach – the magic is conveyed to give me just the right images, and frame of mind right through the review ! Thanks for this lovely comment, I always try to be constructive. I can assure when reading it today, 26/12, it made MY day too ! As we say in Scotland:- A Happy New Year to you !